A chocolate shop in Montclair Village. Linked to ABC Wednesday. Another vintage sign, this one found on MacArthur Blvd. The neon tubing looks in tact but I've never seen it lit up. The clock doesn't run; so I'm betting the neon isn't working either. City Hall reflected in three windows. Linked to Weekend Reflections. The local movie theater sign from a different angle. On weekends, the sign is animated and full of color. Previously shown here. We've had rain this week but are expected to have mostly sunny days through the weekend. Post is linked to Skywatch Friday. Here's one last mural on canvas I'm showing from Peralta Junction. I like the mystical vibe, the 3rd eye, and the essence vapors featured in this piece. For some reason it makes me think of Jimi Hendrix, whose music continues to be magical. This traveling carnival closes soon, and then all the murals that border the site will be taken down. If you like murals or have a mural you'd like to post, this meme's for you. You decide what constitutes a mural. Once you start looking, you'll find them everywhere. Follow the Linky steps below. Be sure to link back to this meme and visit your fellow posters. Looking forward to the mural finds posted this week. A couple of weeks ago I visited the inauguration at Manifesto Bicycles of Oakland's second permanent parklet. 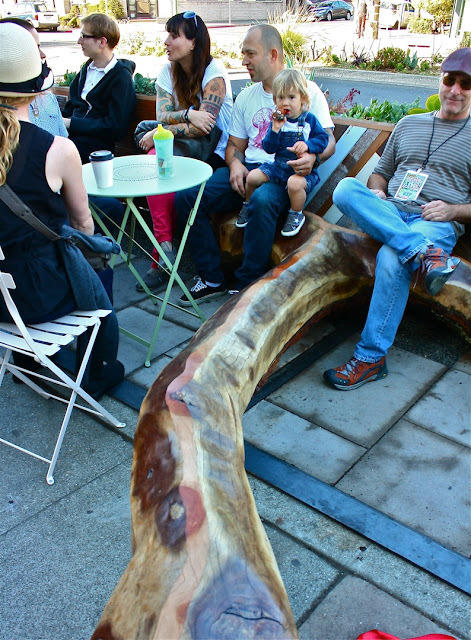 The parklet movement is big in Oakland and San Francisco. It essentially creates permanent mini public seating bumped out into what had been a parking spot. This one had succulents planted behind the seating and a shaved tree limb reaching from the seats out to the sidewalk. A band played and a neighboring brew pub offered libations. Even the mayor showed up. visit Our Oakland for a slideshow of the event. The weather reports keep saying rain, but so far not. Today the sky is a little cloudier but the autumn leaves are still with us. 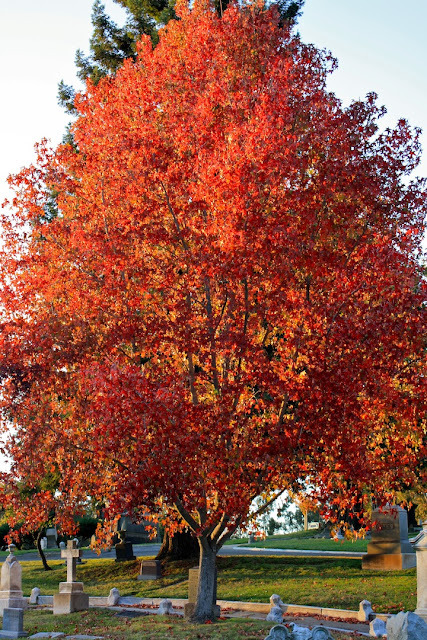 We're not exactly Vermont, but colors can be found if you know where to look. Linked to Skywatch Friday. 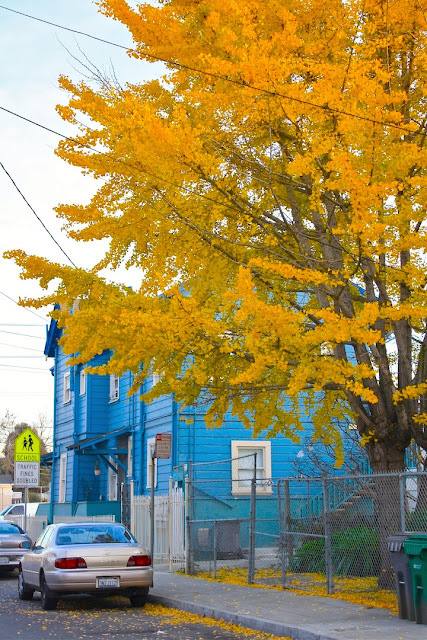 You can find ginkgo trees in the most unexpected locations. This tree is on 26th street just below West St. The yellow leaves next to the blue clapboard house is a pleasing site. One of my favorite coffee houses. 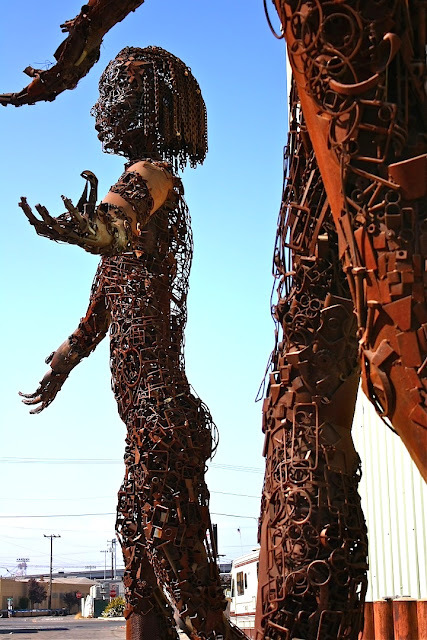 An easy walk from the house, usually open tables, low noise, rotating art shows, and a great tuna salad sandwich. What's not to like? The fact that it just closed. Supposedly another coffee house will open in its place. 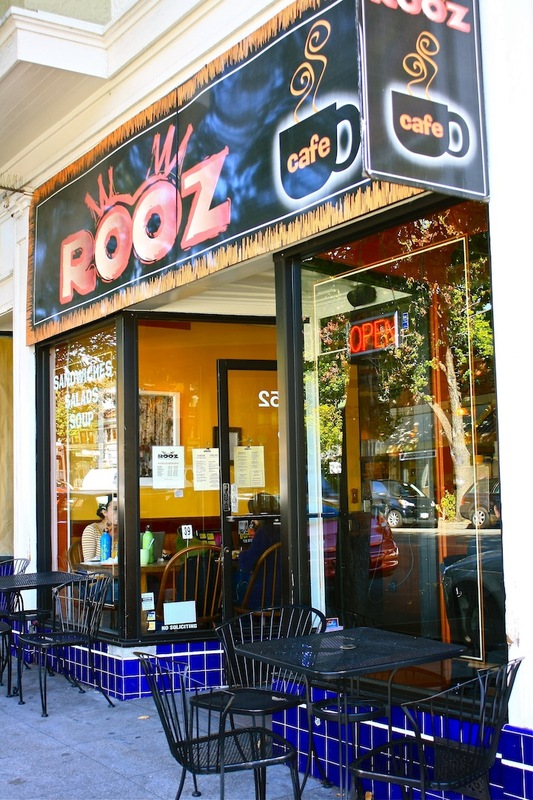 There's another Rooz in town but that means getting in the car and driving. I'd rather walk. Linked with ABC Wednesday. Another canvas mural from Peralta Junction. Don't ask me what this has to do with an old timey "traveling midway of curiosities," but it is amusing. Now that I think about it, a monocle toting walrus would be a curiosity. The window at Manifesto Bicycles on 40th St. Love the font. The reflection with the dash of red was a bonus. 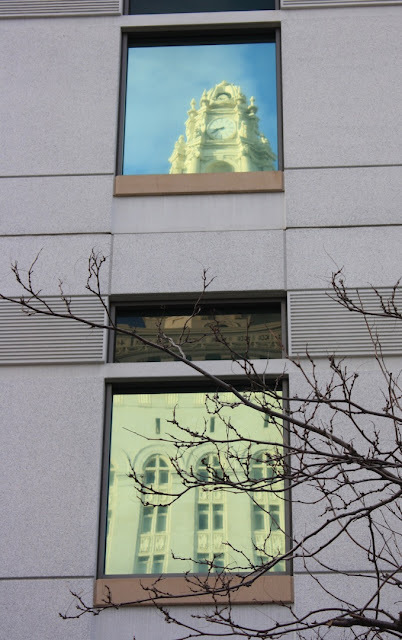 Linked to Weekend Reflections. We do quirky real well in Oakland. This contraption was only one of several unusual wheeled vehicles at the summer Pedalfest in Jack London Square. This is an annual event that promotes bikes and biking. Often with tongue firmly in cheek. Linked to ABC Wednesday. 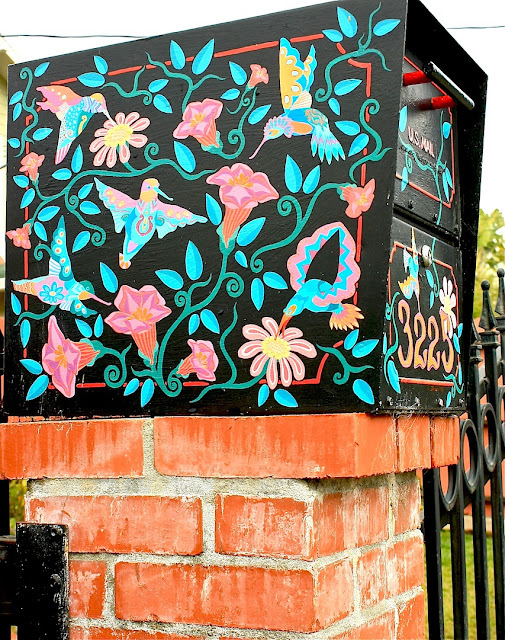 We've all found murals on various surfaces---walls, freeway piers, utility boxes---why not on a mail box? Spotted in East Oakland in the Allendale neighborhood. The artist had fun painting so many colibrí among the flowers. Such a cheery sight. 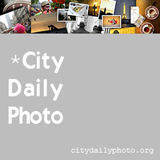 The first of each month is City Daily Photo's Theme Day. This month's theme is "the water's edge." This photo was taken at the southwestern end of the Oakland estuary which is being restored to marshland. Despite a freeway being a few hundred yards to the east and the airport less than half a mile to the west, egrets nest, wade, forage, and just plain rest in this end of the estuary. 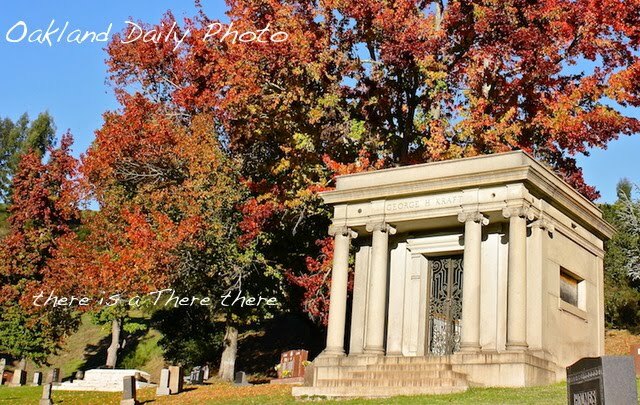 For more takes on the theme, visit City Daily Photo.